Catfish fishing in Bangkok. Glen and his group from Hong Kong return to Bungsamran Lake in Bangkok and bag up on monster Mekong Catfish. Returning client Glen and his group from Hong Kong made their annual trip to Thailand catfish fishing in Bangkok at Bungsamran Lake for monster Mekong Catfish. The group of eight anglers having fished at Bungsamran in the past and landing some bumper catches of Mekong Catfish, wasted no time in casting out a series of floats towards the many showing catfish in the centre of the lake. Fishing at depths between 1-2 metres, the anglers suspended large balls of groundbait beneath sliding floats and waited for action to begin. Within seconds the first Mekong Catfish of the day was netted and brought up onto the fishing platform. 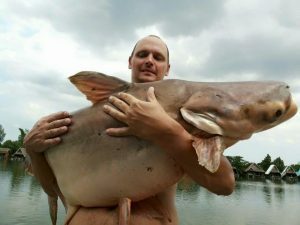 The Mekong Catfish was estimated to weigh 17 kg and quickly photographed before being put back into the lake. The following few hours saw the group bagging up in style with all anglers landed fish to 30 kg’s by early afternoon. Baiting heavily the anglers continued to cast towards the centre of the lake and were continually rewarded by a succession of hard fighting Mekong Catfish ranging between 15-35kg’s. Later in the afternoon one of the anglers hooked a much bigger catfish which proceeded to charge around the lake for twenty minutes. Continued pressure finally took its toll on the large Mekong Catfish which was netted on the second attempt. The Mekong Catfish was estimated to weigh 45kg+ and was proudly displayed for the camera before being released. 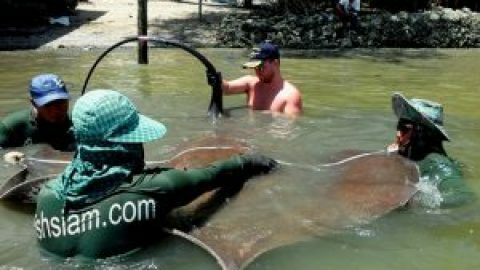 The anglers continued to fish well into the afternoon landing plenty of smallish Mekong Catfish to 25kg’s in addition to several better sized catfish in the 40-45kg region. At the end of the days catfish fishing in Bangkok the anglers had amassed a 65+ fish haul consisting of Striped Catfish to 15kg and Mekong Catfish to an estimated 45kg’s.